Pickwick Lake is situated on the Tennessee River System near the town of Florence, Al. This is where most anglers launch their boat at McFarland park. This public boat launch is about 2 miles downstream – below the Wilson Lake dam tailrace waters – found at Pickwick’s Lake headwaters. Running your boat up this lake is no problem. Just navigate up the middle of the lake and idle the boat down after you go under the last bridge, which is within sight of Wilson Lake dam. Make sure to have your Alabama fishing license, boat registration papers, up-to-date boat stickers, charged fire extinguisher, a throw cushion and life jackets for each boat occupant. When within sight of the dam it is suggested (its the law), you wear your life jacket and have your outboard motor kill switch attached when running the outboard motor. Caution is advised in these lake headwaters, especially for first timers, due to swift current at times. After you go under the last bridge, heading upstream towards Wilson Lake dam, the water is less than 10 feet deep. When getting close to the dam, stay in the middle and avoid idling the boat fast. This is due to all the hidden rocks, some that are just under the waters surface, in 3-5 feet of water near the dam. Trim up your motor and avoid the waters near the dam just past the island on your left. Lots of boulders and swift current here. Anglers that are new to this lake will soon discover fishing these lake headwaters for smallmouth bass and largemouth bass is quite easy although you may soon discover other species of fish tugging on your line as well. Striped bass are found in these lake headwaters as well as drum, gar, white bass, bream, crappie, spotted bass and catfish. Most anglers simply run their boat all the way up to the dam and then make a mile long drift down the lake. Some anglers are successful while bumping their lures on bottom, fishing the middle water column and getting topwater bites as well on a number of lures. 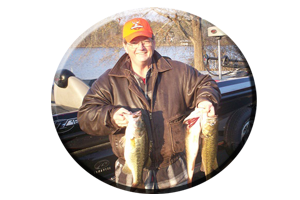 As owner of Reeds Guide Service I have fished Pickwick lake for over 30 years and know it very well. I get phone calls and e-mails every week pertaining to this lake. I fish this lake many times each month and I know a lot of places down the lake (50 miles of navigable water), that I eventually fish as each fishing day lingers on. Still, no how many boats are on the lake I will often start my day searching for bass in these lake headwaters. Why? You may ask. I know from fishing these lake headwaters (hundreds of times in all seasons over the past 30 years), no matter what the conditions, there are always some big bass cruising these lake headwaters in search of an easy meal. On any outing to these lake headwaters, as well as when waters begin to cool even more during the late fall to early winter period, you could actually hook into the smallmouth bass of a lifetime. 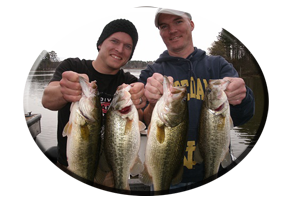 This includes fooling some big largemouth bass and some huge, striped bass into striking your lures as well. 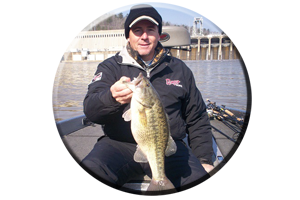 No matter what species of bass you target (or all of them) on this lake, you can create a very long list of lures when deciding on what to bring to Pickwick Lake this fall and early winter seasons. 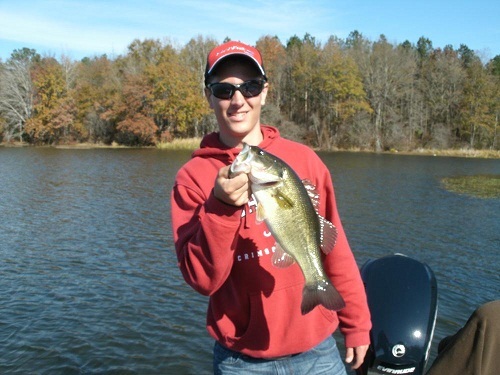 Even in these lake headwaters (from Mcfarland park launch to the Wilson Lake dam), the lure choices range from dozens of various types of lures fished from top to bottom. Not only is the importance of each lure you choose, but the size of your lures, the action each lure imparts, the lure color and even the way you manipulate each lure is important to your success…and you spending less time retrieving or breaking off hung lures in these rocky, boulder strewn Lake headwaters. So make a note right now: bring plenty of lures and a plug knocker! This includes items you may need to replace like spare rods and reels, fishing line in several line tests, various sizes of sinkers, hooks and jig heads. Even items for the boat like spare props for the outboard motor and trolling motor, oil, plenty of gas, pliers, screwdrivers and needle nose pliers. This list of topwater lures (lures fished on the waters surface) grows and grows with each passing season and new topwater lures are springing up each year. 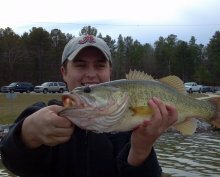 But in Pickwick Lakes headwaters there are certain types of topwater lures that work better than others at times. So like said, bring plenty. The lures that fall in this category are many, mainly due to the fact a prop bait can mean any topwater lure displaying either one or two propellers fore and aft. 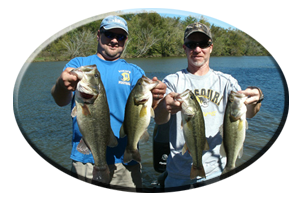 Baby Torpedoes are very popular topwater lures for fishing Pickwick Lakes headwaters. Below this dam a lot of 2-3 inch baitfish are washed through the dam discharge waters and they look like these small topwater lures featuring one propeller on the rear of the lure. Smaller versions called, “the tiny torpedo or the teeny torpedo” may work even better like when following a cold front, during very calm and clear water conditions, on days with bright, bluebird skies or even when faced with fishing pressure. These prop bait topwaters should be fished on (preferably Trilene Big Game monofilament or fluorocarbon line in the 12-15 pound test category), making long casts with 6-7 foot rods, and then retrieving these prop baits with short jerks of the rod. This stop and go lure action creates a loud, swishing noise on the surface of the water, real similar to the sounds of fleeing shad and other baitfish found here. Colors of chrome / black back, chrome / blue back, gray ghost, or fire tiger usually work very well, in both looking like these baitfish and when made to imitate the small shad found here. If its calm and very little current is evident, you may have to fish these lures with subtle actions or try downsizing to smaller models. If there is a slight ripple on the water and more current then you may fish these lures with harder jerks of the rod. If the conditions show its real windy, lots of current and a choppy look to the waters surface, you may need to go to a double prop bait topwater like a Crazy Shad (or for you old timers a Devils Horse), to create more noise and to aid in attracting these feeding bass to your lures. The old Rebel pop-r’s always come to mind, in fact many anglers just say, pop-r’s when referring to these topwaters featuring a concave mouth. But there are many types some old ones like those called chuggers, Hula Poppers or Chug Bugs all that work just as well as any of today’s poppers. Colors of shad or bream work well in these lake headwaters. Schooling bass will nail these loud, surface lures that actually sound like feeding bass when jerked real hard. Line of 12-15 pound test is suggested. This topwater list will always have to include the Zara Spook created by James Heddon, that started it all, over 80 years ago in the early 1900′s. It is my favorite walking type topwater lure (See: www.fishingalabama.com on the home page link, “Everything you always wanted to know about fishing the zara spook”), that now comes in 5 sizes. Most anglers throw the original size two hook zara spook on 14-20 pound test line. Some anglers downsize their spooks fishing the smaller versions zara pooch or zara pup on lighter line. Other anglers either have the three hooked, Zara Super Spook handy or the Baby Super Spook tied on, for attracting some vicious topwater lure strikes found in Pickwick lakes headwaters. Anglers should keep in mind there are some oversized end of the year threadfin shad and gizzard shad that these bigger bass feed on. These topwater walking type lures really can simulate these type of prey. Colors vary among shad colors and chrome. The Spittin’ Image and the Lucky Craft Sammie are also good walking type topwater lures. I suggest 20 pound test monofilament line for these oversized offerings. This lure category includes lures fished just under the waters surface, to five feet deep or more. In eddy areas like behind points or around big boulders found in these lake headwaters many of these bass suspend while waiting for the current to bring them an easy to catch meal. Often these bass will not rise to well placed topwater lure. At times they may be reluctant to move from their choice little spot to go to the lakes bottom and feed. So lures that run as they say, “right in their face” can trigger instinct strikes…other lures may fail to produce. 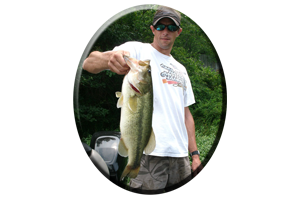 They may slam a slow moving spinnerbait (or dropped or slow rolled spinnerbait), or an erratic fished jerkbait (including soft jerkbaits, or floating and suspending hard bodied jerkbaits) or a shallow to deep diving crankbait (its according to what depth your fishing), may be the right lure. In this circumstance, without these suspended bass not having to move far or chase down a lure, these lures may work better than other lures. 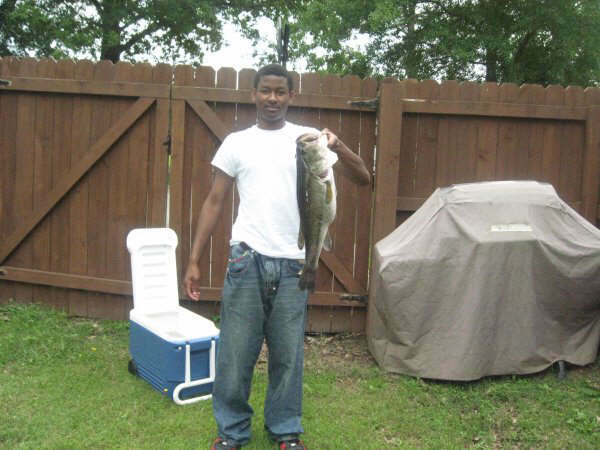 Keep in mind these bass feed a lot on crayfish found in these lake headwaters and lures such as No. 5 crayfish colored Shad Rap could just be the lure, besides just showing them baitfish colored lures all day. So experiment and always have several rods already rigged and ready. Lewis Rattletraps”, or Cotton Cordell’s Rattlin’ Spots, etc. Experiment with smaller 1/4 ounce versions fished on lighter line of 12-15 pound test, like when facing into little current, or when seeing bass feeding on smaller baitfish, when faced with clear water clarity, following cold fronts or during bright, bluebird sky conditions. Use heavier, 1/2 ounce model lipless lures when in swifter current or when fishing deeper water. Colors of shad, chrome and crayfish are good choices. These are lures drug across the lakes bottom or lures allowed to entice bass holding just above the bottom. The rigging can be Texas style, Carolina rigged, drop shot rigged, rigged on a jig head or even fished weightless. The lure choices are many. Just visit any tackle store and most of the time half or their lure inventory could be soft plastics like worms of all sizes, lizards, grubs, shad imitations, Senkos, tube baits, crayfish imitations, creature type lures and small, finesse plastics fished on bottom. Jigs, jig combos, jigging spoons or tail spinners are also fished on or near bottom. The problem is they do hang up a whole lot. This is time consuming, but you can usually retrieve most hung lures since these headwaters are shallow. Like said, bring plenty. Besides fishing the lakes headwaters around Wilson Lake dam, there are other places that are productive this fall season on Pickwick lake. The nearby barge canal, bridge pilings, rock bluffs, river ledges, barge tie ups and wood cover such as laying trees, brush, stumps and logs. Or an angler can head down the lake and explore over 40 miles of incoming creeks, small cuts and pockets, main lake flats, creek mouths, submerged islands, visible islands and piers, boat houses and marinas. Or you can fish Pickwick Lake half a day, put the boat on the trailer, stop for a hamburger and be launching on upper Tennessee River Reservoir Wilson Lake in 30 minutes. 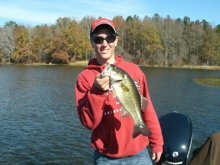 Call on Reeds Guide Service and learn to fish Pickwick lakes shallow to deep water bass. “Over 40 years exploring Pickwick lake in all seasons.” Remember, a guided fishing trip with Reeds Guide Service makes a great surprise Christmas gift, Birthday gift, Father’s Day gift, or good for any occasion, for those loved ones that love to fish. See my website: www.fishingalabama.com for more info.